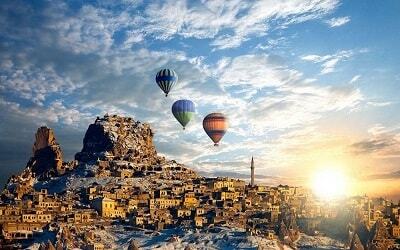 Add some excitement and relaxation to your holiday by participating in Izmir Pamukkale Tour. This exploration will take to the Pamukkale’s famous attractions and will offer you a great opportunity to enjoy swimming in hot springs. Combine sightseeing and relaxation, while admiring Pamukkale’s natural beauty and create long lasting memories. Izmir Pamukkale Tour starts in the morning, when our team members will pick you up from your hotel in İzmir or from Izmir Airport. You will be traveling in a modern, comfortable and fully air conditioned bus for one hour until you reach Selcuk. There, a small break will be made and participants will then continue with a bus towards Pamukkale. You will be accompanied by a professional tour guide who will make sure that you enjoy the excursion by assisting and providing important information about the places that you are about to visit. 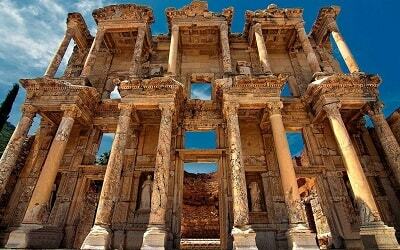 The bus trip from Selcuk will have an approximate duration of three hours and multiple stops will be made during the ride in order to take a break. 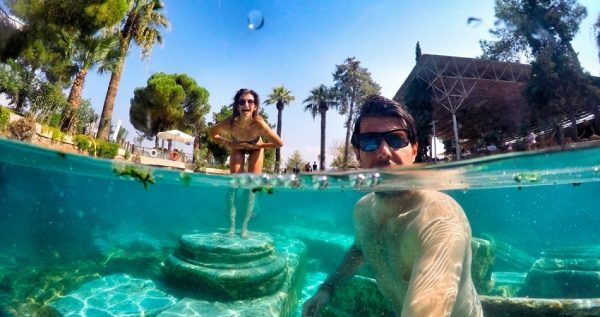 At Pamukkale you will enjoy three hours of free time. You can spend this time depending on your interests as several attractions are located there. 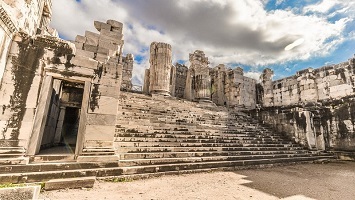 You can make some sightseeing by visiting the ancient city and the necropolis of Hierapolis. Moreover, you can admire nature by walking around the travertines and taking some breath taking photos. 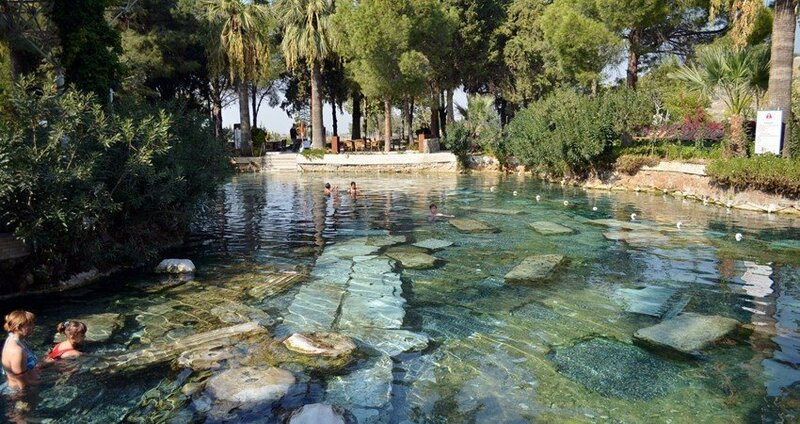 In addition, you can enjoy swimming in the natural pool of Cleopatra. More precisely, the Travertines or Cotton Castle as it is known is a naturally made, white colour mountain. Water springs flow through the mountain and fill white terraces with water. Indeed, this place is a famous tourist attraction worth visiting. Those who enjoy sightseeing, the ancient city of Hierapolis is the ideal location. The city used to be a major curing centre during the Roman period and it was evolved as a spiritual, creative and commercial location. Finally, the Cleopatra Thermal Pool is also an attraction in Pamukkale that you can visit. It is a big natural pool that has thermal waters. You can enjoy swimming and admire the beauty of nature in this amazing pool. 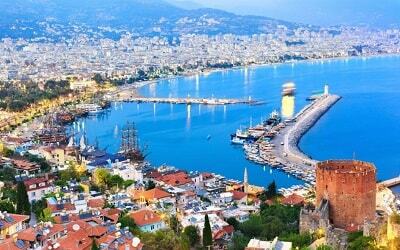 During the afternoon, the bus will start on its way back to Izmir. Full of memories, relaxed and amazed by the scenery you will return back to your hotel. 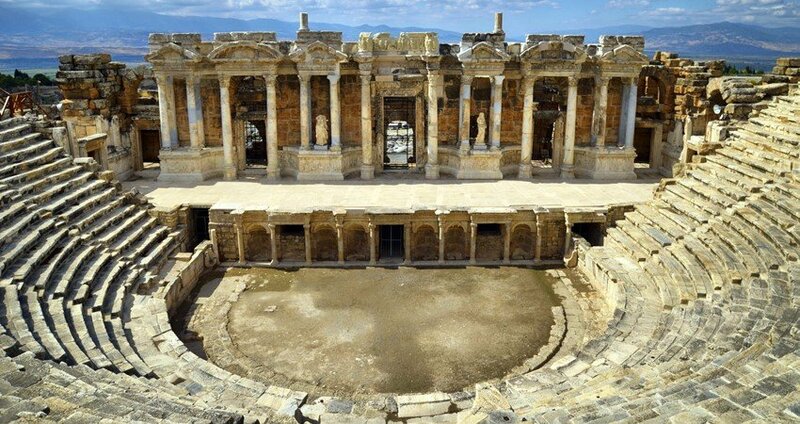 This full day Izmir Pamukkale Tour will be for sure a notable highlight from your holidays. 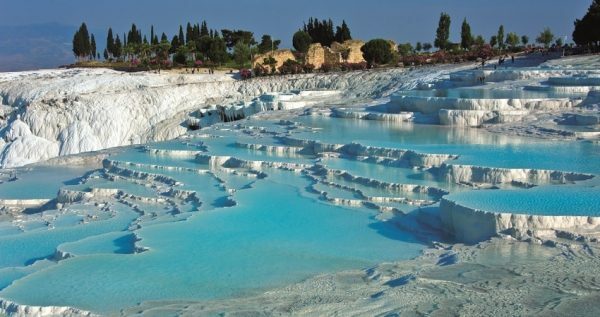 Take the chance to participate in the exciting and relaxing Izmir Pamukkale Tour. 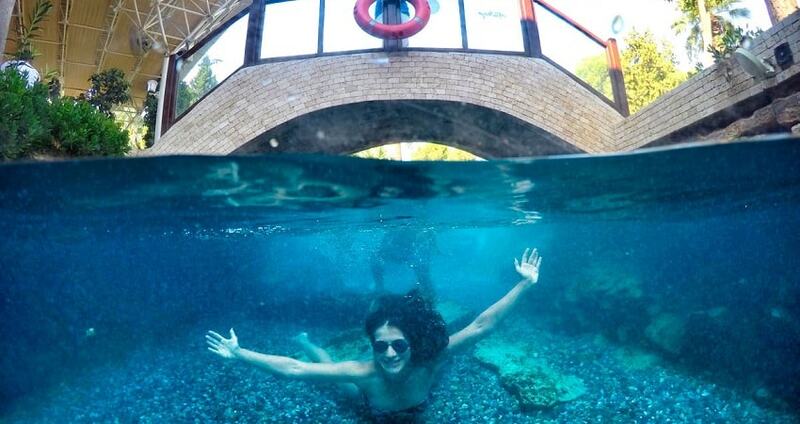 Admire nature, observe unique locations and swim in thermal waters with this full day excursion. The exploration is ideal for all as it combines sightseeing and relaxation. 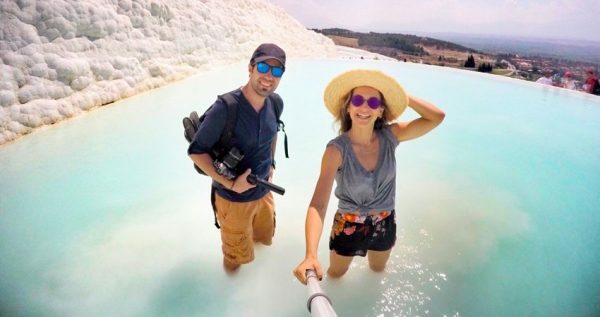 Your trip to Pamukkale will be a long lasting memory from your holidays. 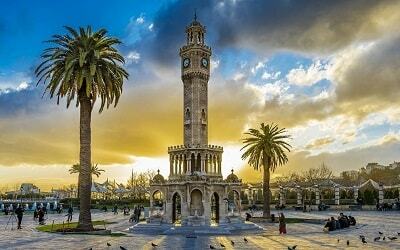 Izmir Pamukkale Tour starts during the morning, when a comfortable vehicle picks you up from your hotel in Izmir. The bus will drive you towards Selcuk where a small break will take place. From Selcuk, you will continue with a different bus towards Pamukkale. You will be travelling with a comfortable, modern and fully air conditioned vehicle. During your excursion, you will be accompanied by a professional guide who will be there to assist you. In addition, the guide will explain important facts for the places of interest. Once you arrive at Selcuk, a small break will be made and then you will continue with a bus towards your destination. It has to be noted that the road trip from Selcuk to Pamukkale will have an approximate duration of three hours. However, several short stops will be made in order to relax and take some photos. In Pamukkale, you will have 3 hours of free time to spend according to your interests. 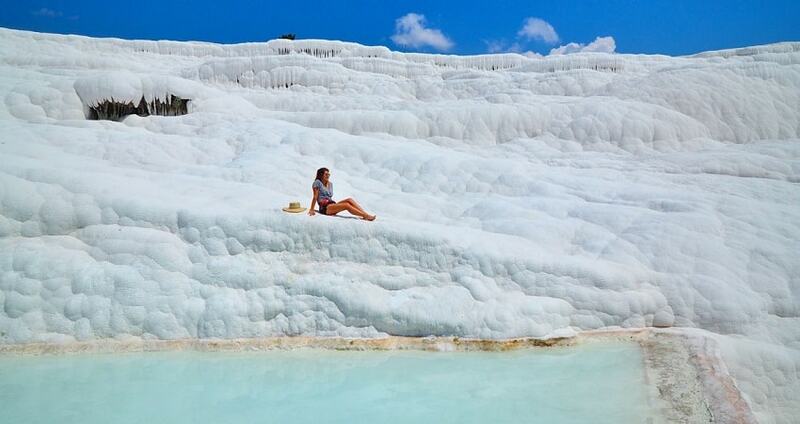 Pamukkale has a variety of options and locations where you can enjoy your time. 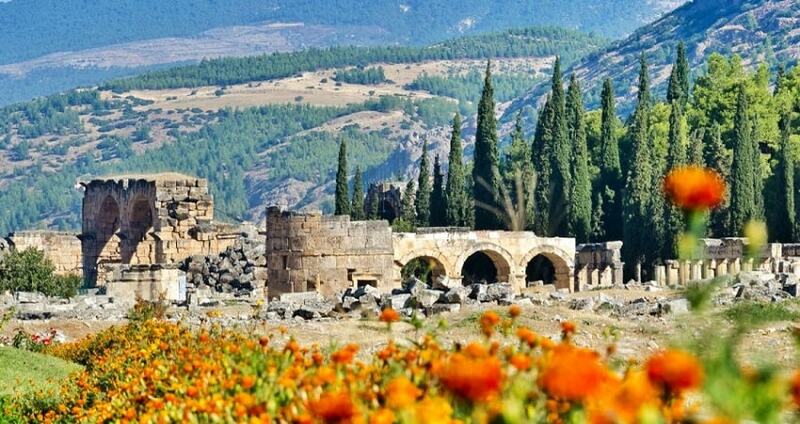 The ancient city of Hierapolis can be ideal for those who wish to explore the culture and the history of the place. Pamukkale is also famous for its thermal springs and the Cotton Castle. Forming one of Turkey’s most famous attractions, the Cotton Castle or the Travertines will impress you with the natural beauty that the area has. The Cotton Castle is in fact a naturally shaped white washed mountain with thermal water springs that flow into white terraces. Visitors have the opportunity to swim and enjoy the therapeutic benefits of the hot springs. The location is also ideal for spectacular photos as the patios of the mountains are of unique beauty. The ancient city of Hierapolis was built during 190BC and became a famous curing centre due to its close proximity to the thermal springs. 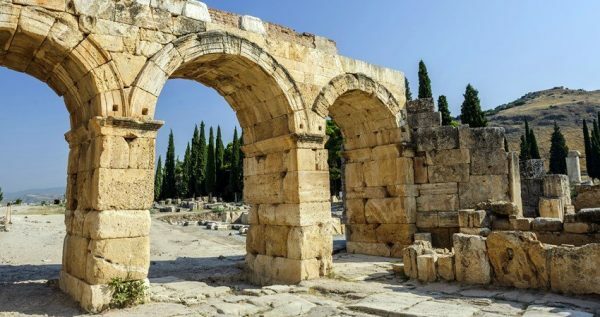 During the Roman period, the area was one of the most important spiritual and creative centres as many people were visiting the area in order to relax their body and mind. For those who are interested in sightseeing, Hierapolis is a great location to observe the ruins of the ancient settlement. During the 3-hou free time, you can also visit the Cleopatra Thermal Pool. The area features a big natural pool with hot springs. During the Roman period people used the pool for health and treatment purposes. You can enter the pool at an extra cost and enjoy all the associated benefits of such therapeutic experience. 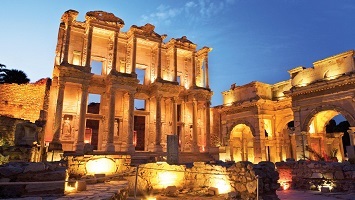 Izmir Pamukkale Tour finishes during the afternoon and the bus will start on its way back. Full of great memories, relaxed and amazed by your exploration, you will arrive at your hotel in Izmir during the afternoon.